Zita is one of the most well-known figures in the galaxy, but the price of fame is high and the public are fickle. When Zita decides to get away from it all thanks to a helpful double things go very wrong and the nature of her heroism is questioned in a second volume that doesn't quite capture the magic of the first. Sequels are a hard thing to pull off, and this one is no exception. Like many, Hatke makes a choice to use this book to darken the story a bit and make life difficult for the protagonist. There's nothing wrong with doing that except that, well, it's done so often that it's no longer all that shocking or, frankly, as interesting as it could be. By the time we get to the idea that Zita is no longer favored by the public, not even the clever allusions to J. Jonah Jameson can make up for the fact that we can see where this is going--Zita's gonna be a fugitive on the run. The second trap that seems to plague follow-up books these days also strikes here, with Zita's story cutting off at what appears to be the lowest point possible, with seemingly no hope at all. There's probably a term for this in relation to storytelling, but I call it "The Empire Strikes Back Effect," and honestly, it doesn't work for me, and it didn't even when I was about the age group that Zita is marketed to. I have no problem with making things hard for her--that's just good storytelling. Where I get hung up on is the idea that this point in the narrative, all too often, is placed right at the end of the second third of the overall arc. It's far too predictable because the reader is expecting it. I'd have liked to see Hatke go in a different direction. Despite this problem, there's still a lot to like here. Zita is shown as a girl who hasn't quite learned her lesson yet, and still acts like the arrogant girl who bullied her friend and nearly got him killed. She takes the easy way out to avoid the crowds, then makes choices she can justify as being right (like stealing a spaceship) but don't hold up under closer examination. Worst of all is that it may not be Zita that pays the price for these lapses in judgement. I really like the fact that Zita is a flawed hero. She's brave, but also reckless, and Hatke doesn't shy away from showing how that combination can be dangerous, both for Zita and those around her. I also like the arc given to the robot that ends up posing at Zita. It's clear from the first appearance that it's going to be trouble (the box it comes out of is stamped 'recalled' after all), but instead of just letting it play out as an increasingly disruptive force, the 'bot is allowed to show it, too, can be a hero. It makes for a great climax that allows us to see that Zita's influence is generally a positive one, even if she can sometimes make a real mess of things. 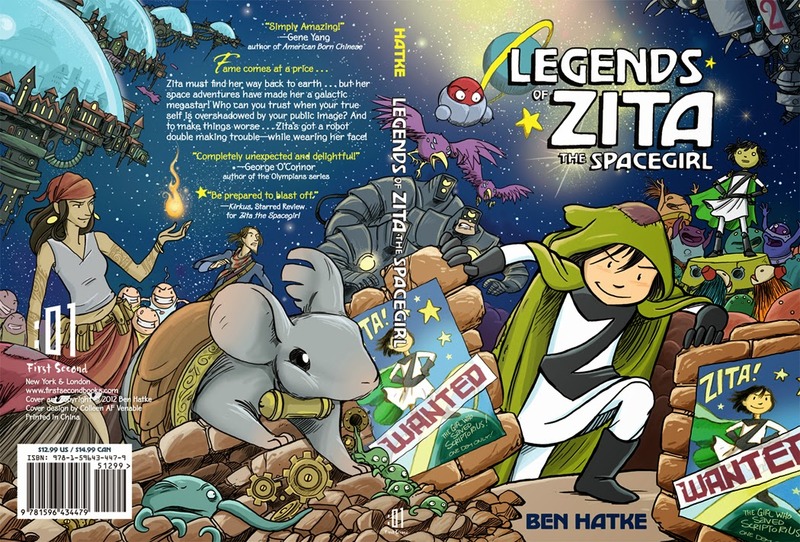 As in the first volume, Hatke's world is varied and colorful, and I like the idea of adding a new set of characters who echo Zita's current friends but don't clone them. Madrigal is another traveling rogue, the other half of Piper's coin, and she has a cat. They also link up cleverly in a nice plot element that should pay dividends in the third and final book. The idea that Zita isn't sure who to trust, given her experiences with both Piper and Madrigal have been less than ideal, also adds a layer of depth. 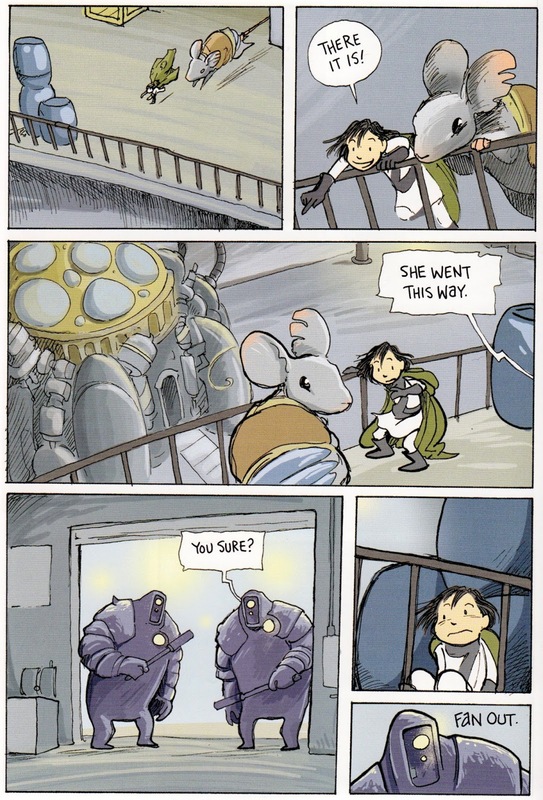 I spoke about how much I like Hatke's art in my review of the first book, so I won't belabor it here. Hatke continues to find ways to make things look as alien as possible, and I think if anything, it's done better in this book, because we move away from the Easter Eggs and more into his own creations. There's a definite comfort level being reached here, as aliens with multiple arms argue with those featuring a plethora of eyes over who better runs a ship. Hairy creatures with fezzes seek out Zita's aid. The police force is a set of argumentative robots. This world is so vast and it feels galactic in scale, and that's all due to Hatke's artwork and creative designs. You can see his process work in sketches at the end of the book, too. But the best visual this time out is the villain, which are super-aggressive hearts. A deceptively cute pink, these gigantic muscles look like Valentine's Day Candy via Venom from Spider-Man. They're menacing as all get out, making a great foil that only Zita can stop--or is there someone else able to save the day? 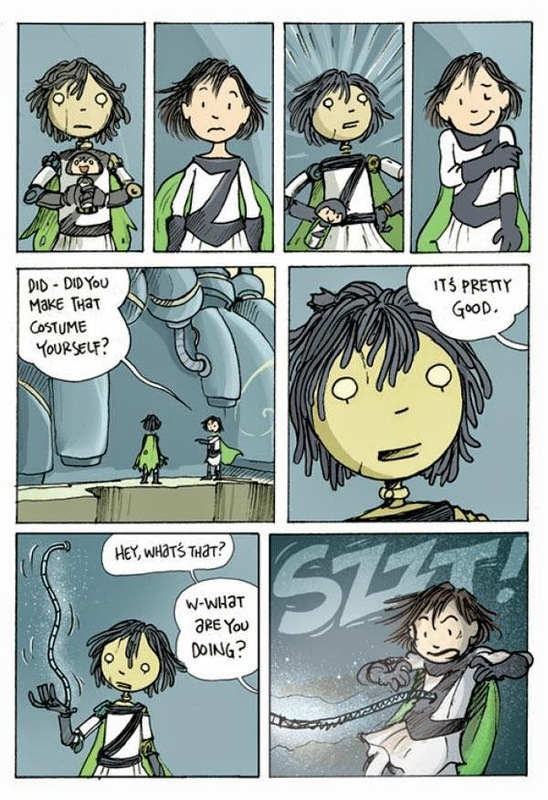 Though there are some issues with the story structure, I still enjoyed Legends of Zia the Spacegirl a ton. Hatke has a very strong handle on his overall themes and story ideas, which we see here, and his art solid backs up the character arcs devised therein. The series wraps with the third volume, a review of which follows this on in a few hours.